It seems that food establishments are prone to being embroiled in controversy recently as the latest one to make headlines is Ninja Joe and their burger called ‘P.Ramly’. The Muslim Consumers Association of Malaysia (PPIM) have expressed their wishes for authorities to take action against the non-Halal chain restaurant. 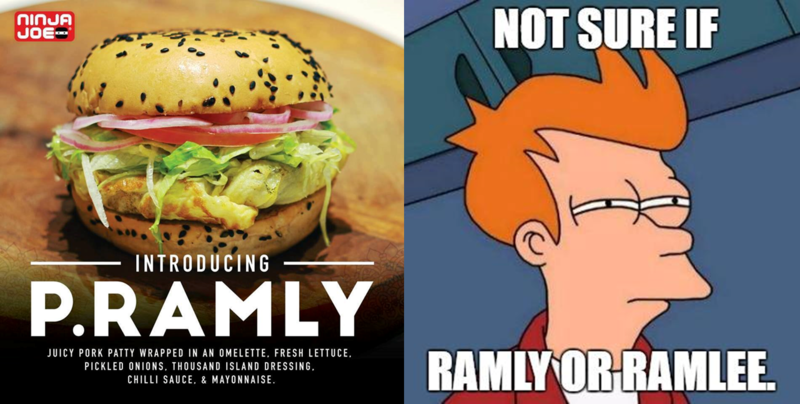 In naming one of the pork burgers ‘P.Ramly’, PPIM claim that it has potential to confuse the public. PPIM head Datuk Nadzim Johan said that the Domestic Trade, Cooperatives and Consumerism Ministry (KPDNKK) should take action because the restaurant’s actions in purportedly ‘confusing’ consumers were an offence. “According to the Consumer Protection Act 1999, action can be taken against businesses who give a confusing picture about their goods or services,” Nadzim was quoted saying. The comments discussing this issue highlighted that the main concern was the advertisement’s placement in a public area with heavy traffic. Most of the confusion stems from the fact that the name sounds alike to actor, Tan Sri P. Ramlee who is very well-known and beloved among the Malaysian community. The poster of the burger was placed in a prominent location in a shopping centre in Damansara but it clearly states that the dish contained pork. Vulcan Post reached out to the co-founder of Ninja Joe, Kelvin Tan for his side of the story. He mentioned that the P.Ramly burger was essentially launched for Merdeka. The name itself came from the brand ‘Ramly’, the very famous company known to produce frozen meat products including burger patties. We all know and love the iconic Ramly burgers which are commonly sold all over Malaysia. Thus, the P. Ramly was a homage to that burger with the ‘P’ in front standing for pork. “It’s a Ramly-style burger that happens to have pork patty in it. The fact that it coincides with the actor Tan Sri P. Ramlee’s name is pure coincidence, since the actor’s name is not even spelt that way,” said Kelvin. Ninja Joe has since posted on their FB page asking for their followers to vote for a different name for their burger after receiving feedback to do so. “I received a message earlier this morning; he was kind enough to say that though he appreciates the sense of patriotism in the name, he suggested there may be a better way to go about it. So he gave me some alternatives which I think is a great way to give me constructive feedback. I put up a poll on our Facebook page with his suggestions to see what we can work with instead,” said Kelvin. He also expressed that it was never his intention to have the name to be likened to the actor. “The name is just a short and simple way of paying homage to the Ramly burger. Regrettably, some people got the wrong idea so we’re working on fixing it. We’ll be removing the posters and changing the name so hopefully this will help resolve the issue,” said Kelvin. Feature Image Credit: Compiled from Ninja Joe & imgflip.